What causes back pain once the position is changed from sitting? 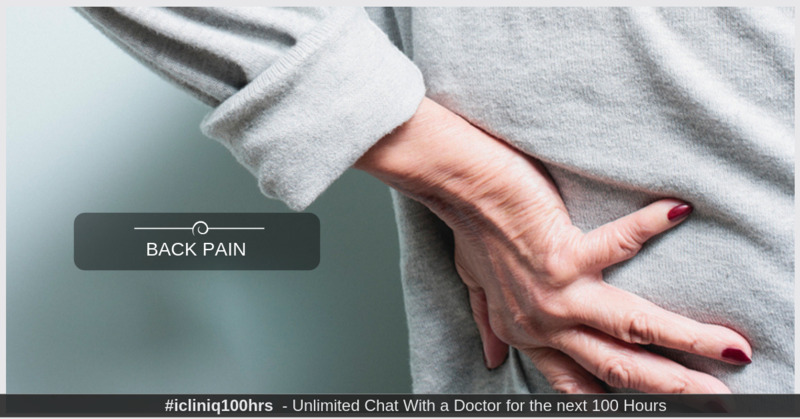 iCliniq › Ask a doctor online › Answers › Fitness Expert › Back Pain › There is back pain after getting up from sitting position and walking. Why? Q. There is back pain after getting up from sitting position and walking. Why? My mother is 65 years old (height 4'11", weight 64 kg), and has been doing all the household chores since she was 20 years. She has no problems except diabetes. Since one week, she started getting lower back pain. The symptoms are if she is in a sleeping position and gets up and starts walking, there is no problem. But if she is in a sitting position and gets up to walk, there is sharp lower back pain. Can you please let me know what could be the reason? How can the pain be relieved? Any special exercises or chair or vitamin supplements, etc.? • My arm has become stiff due to cervical spondylosis. How to get it treated? • I was suggested surgery for cervical spondylosis. Should I go for it? • Can my back pain be due to the tethered spinal cord? At 65, your mother seems to be suffering from spondylosis which is nothing but wear and tear of the spine. This is made worse after any period of rest and sitting usually makes it worse. Is there any radiation of pain to the leg? I will recommend that you get an X-ray of the affected part like lumbar spine AP and lateral. In the meantime, I will also recommend that she tries hot packs or preferably ice packs over the site area to see if that relieves pain. She can also apply Dynapar QPS spray. Take Ultracet for pain one tablet twice a day. Please send me the X-rays for further advice. Can imbalance occur due to cervical spondylosis?